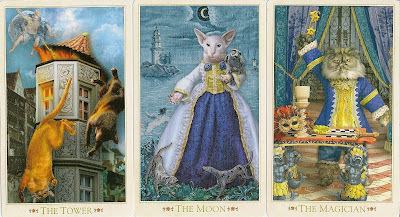 This is the third edition of the deck (November/December 2011). 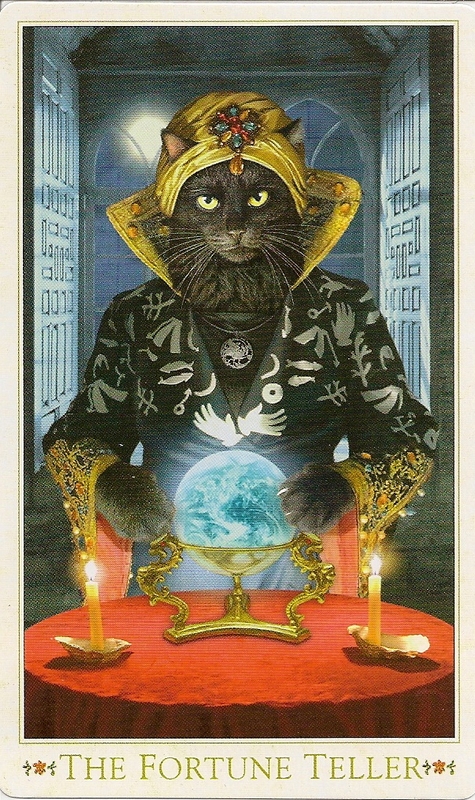 The original deck was way back in 2004, this version has completely reworked the cards, with many changes in images - these include changed to the cats themselves, as well as alterations to colours, backgrounds and overall styling, but the spirit of the deck has been preserved. Miniature models dressed in miniature custumes were used for the cat characters, and these are set against Baroque backgrounds mainly taken from Prague and other parts of Czech Republic (for details see here ). The general composition of the illustrations largely follows the Rider-Waite designs. The majors are not numbered (allowing us to place Strength and Justice wherever we choose). The deck came with a title card, a LWB and the new extra card "The Fortune Teller" (in the first edition it was "Hermes").The backs of the standard size edition are not reversible.